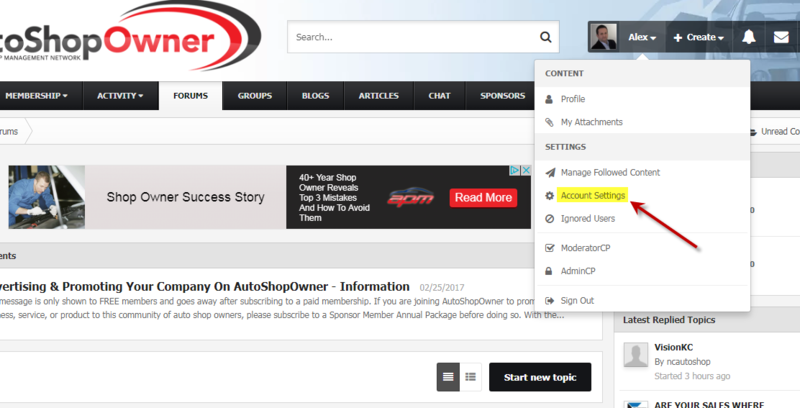 As a member of AutoShopOwner, you can manage the types of notifications that we provide you for when things happen here, either via email or when you login and view your notifications list (the bell icon). For instance, when you start a new topic in a forum or reply to an existing topic, you are automatically subscribed to receive a notification when new content is posted. That can happen by email or not, depends on how you want to receive it. There you will see some your current preference settings for overall delivery method, follow preference, browser notifications, etc. Scroll down and you'll see individual notification settings where you can pick and choose how you are notified. For email, an email is sent every time that action takes place based on your delivery method above. For Notification List, every time an action takes place, it will be listed in your notifications panel under the little bell icon. One more setting we have is for our weekly newsletter, which includes a list of topics and activity from the week. You can opt in and out from your account settings as well.